This dolly to transport 30-series and H40R trusses is made of a combination of lightweight plastic and steel, offering a rigid base to transport a stack of trusses. The dolly is used in combination with the truss carrier (ACC-515) and has a special compartment to store 5 of these. The dolly has handlebars and special stacking rims to stow away your empty dollies efficiently. The trusses are fixed to the dolly by means of a ratchet strap (ratchet is included). The stable and robust dolly has 4 rotatable wheels with brakes. It offers an excellent transport solution for your truss, especially for smaller event locations or venues with limited access. It is possible to order the Truss Carriers in your own company colours and with your company logo. The Truss Dolly has a special compartment which can store 5 Truss Carriers. The Dolly has reinforced wheels with brakes. 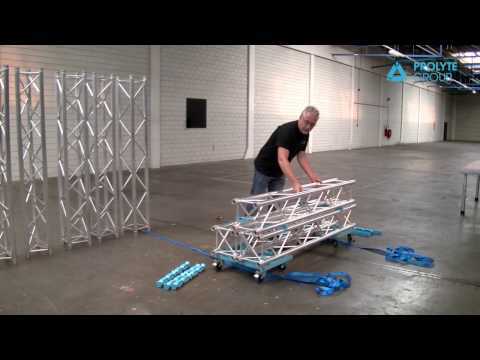 It is possible to stack 6 rows of truss on each other. Square and Triangular truss can be mixed per row.